Ideas for Scrapbookers: A handmade Dahlia for your pages! 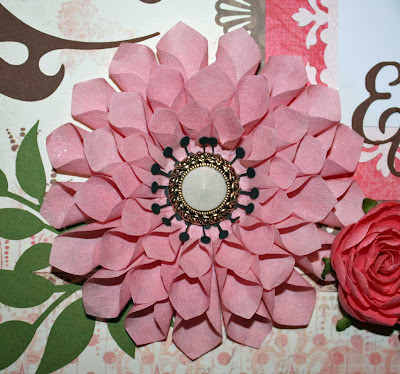 A handmade Dahlia for your pages! I was surfing the internet and ran across a beautiful handmade Dahlia. It was created by Megan Reardon out of felt and shared as a Mother's Day corsage. You can find the original instructions at holidash.com, click here. I thought this flower was so pretty that it might make a lovely addition to a scrapbook page if I could come up with the right paper. After experimenting a bit I decided to try coffee filters. This gave me the best result. Coffee filter paper is light weight, very flexible and takes color well. 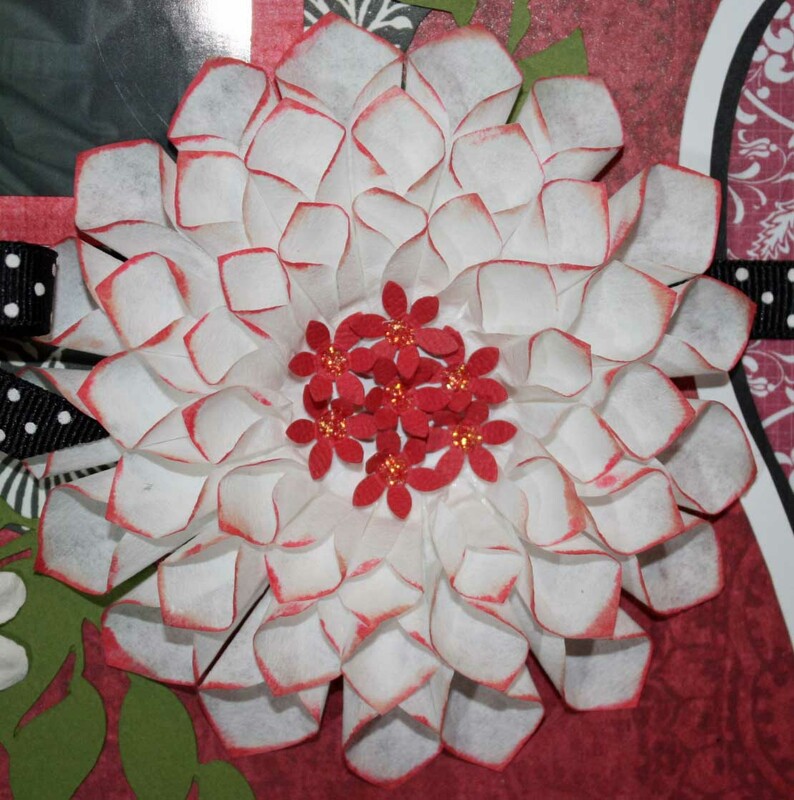 Here is a layout using my coffee filter version of the Dahlia. This is one of my favorite pictures of my mother. To make this flower you will need the following supplies. Two flat white coffee filters, quick drying glue and Glimmer Mist. For my flower I chose the color Pink Bubblegum. To get started I got out my craft sheet and sprayed both side of each coffee filter with glimmer mist. Since I wanted the color to be as rich as possible, I saturated my two coffee filters turning them over a couple of times while I worked. Once I was satisfied with the color I let them dry completely. 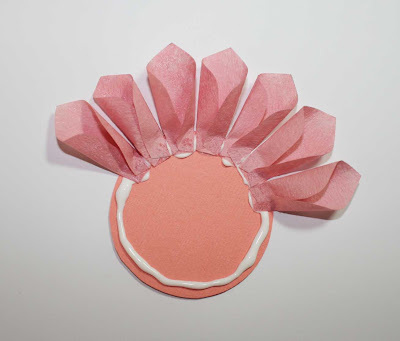 I then traced petal shapes onto the coffee filters and cut them out with scissors. I left my coffee filters as they came out of the package, so I was cutting through two thicknesses, giving me two petals for each traced shape. The original instructions at holidash.com did not include a template, but I created one to share with you so that you could see the exact shape I used for my petals. The largest petal at it's widest spot is 1 1/8 inches across. The medium petal is 1 inch wide and the small petal is just over 3/4 of an inch wide. 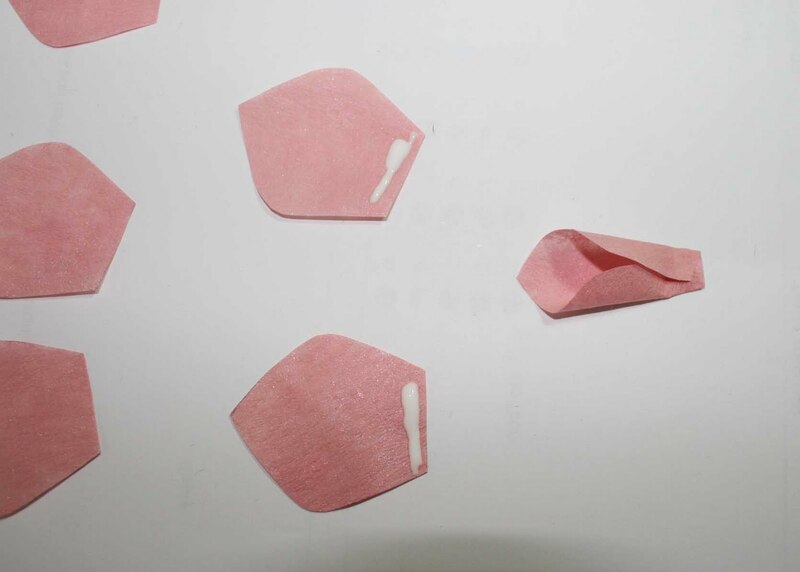 The number of petals you will need to complete a flower can vary as the petal sizes are influenced by how much you fold them. 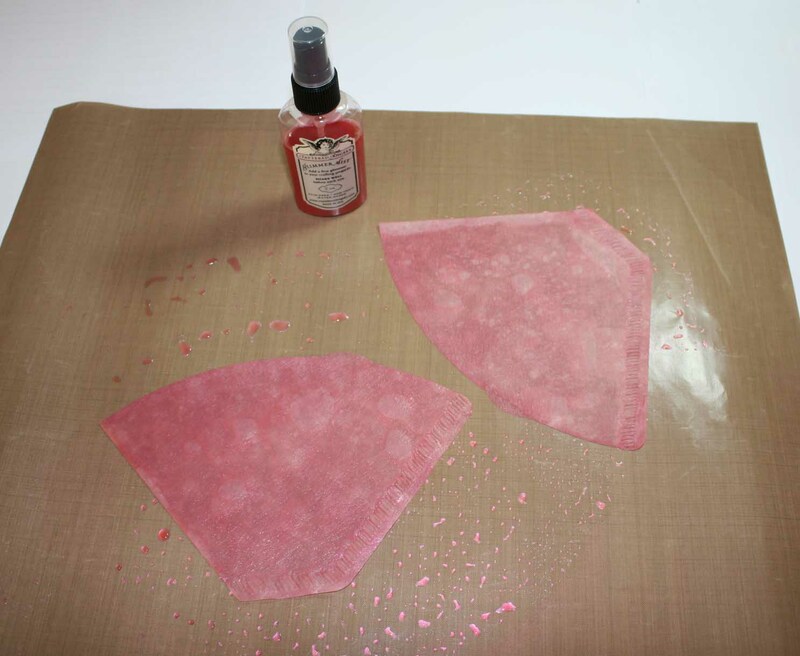 I recommend you cut out 18 large petals, 16 medium petals and 14 small petals. You will also need to cut out the 2 inch circle in the template from cardstock. It will be your base to hold the petals. To form the petals I placed a line of glue at the base of the petal and gently folded/rolled the edges toward the center. I held the folded petal just for a few seconds so that my quick dry glue would take hold. As you are working with the petals, try not to create a hard fold in the paper. The final flower will look more realistic if the petals have a rounded look. Once I had all of my petals glued I attached them to the cardstock circle base starting with the largest petals on the outside. I then placed the second row of petals just inside the large petals. Then I did the same thing for the final row of small petals. The finished flower will need some embellishment in the center. 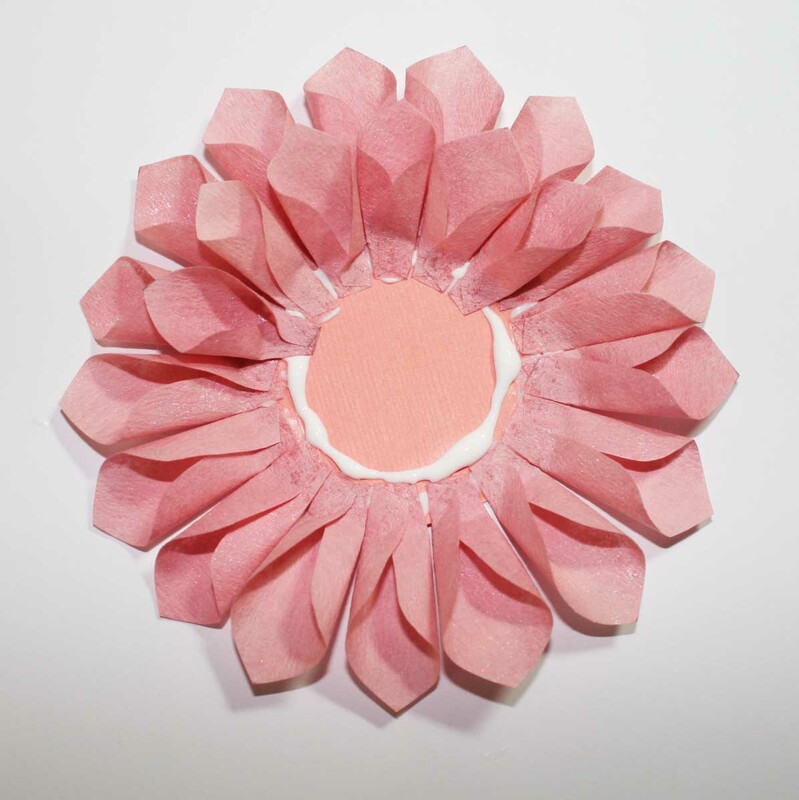 I chose some cardstock stamens and a button for my pink flower. I also make a while flower. This one I didn't color with Glimmer Mist, instead I left it natural and colored the edges of each petal with distress ink. To complete the while flower I bunched some smalled punched out flowers in the center. Here is my final layout with the white flower. I hope you will enjoy giving this a try! They are really beautuful.In Italy i believe we do not have coffee filters like the ones you used, but maybe i'll try with something different. Thank you! Whoa - that is really awesome Dolores! I've got to try this. Thank you for sharing!!! Great technique. I saved this to use on our wedding album. Gorgeous!! I will have to try those! Thanks Delores! That is absolutely stunning. Time consuming I see but well worth the effort. Definitely beautiful! Thank you so much for sharing Dolores! oh wow! those turned out really gorgeous!! wonderful work! Delores this is gorgeous. I love this flower! Very pretty and thanks for the tutorial! Your beautiful flower has been "Spotted" by CARDS Magazine on Northridge Publishing's new Create: blog! Thanks for sharing your talents with us. Sorry,my English is not good but i want to tell you that your handmades are very cute.Thanks for those ideas! I love making flowers and these are absolutely gorgeous! Will definitely try these for sure! Thanks for sharing your great tutorial! Handmade Flowers From Net & Paper Hearts! 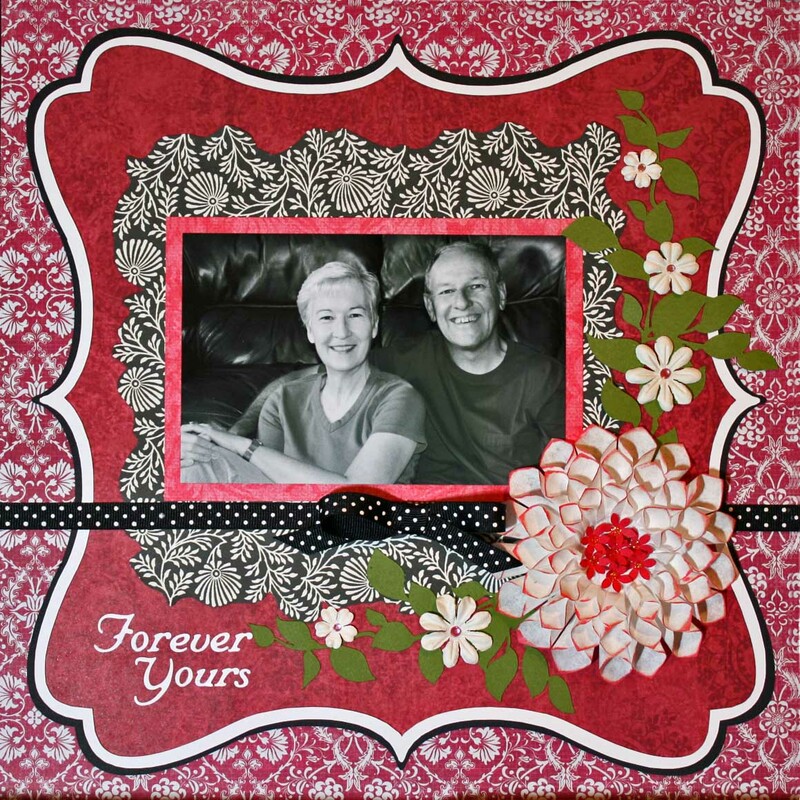 Fun, Creative Gifts by Monika W.! Introducing Our Featured Artist for August 27! Designer Showcase: Back to School Pages! Diva Feather Flowers by Vicky A.! Introducing Our Featured Artist for August 20th! A new Swirl Template for your photos! 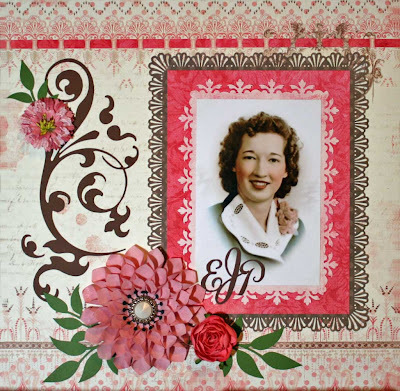 Dress Up Your Chiboard Tutorial by Irit! Introducing Our Featured Artist for Aug. 13! Tint Your Photo Any Color -Tutorial! 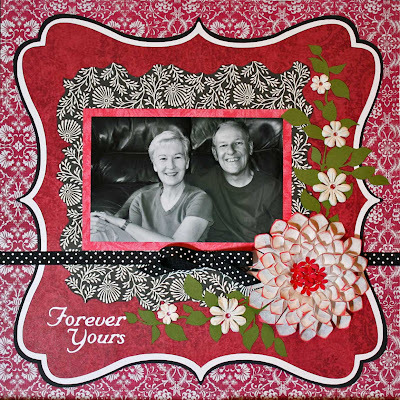 What Was I Thinking by Linda C.
Introducing Our Featured Artist for August 6th! Look for Featured Artists for Fridays! Designer Showcase: Enlarged Photos on Pages! 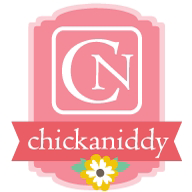 Reader's Pages + contest at GCD Studios!